We represent chord collections by simplicial complexes. A temporal organization of the chords corresponds to a path in the complex. A set of n-note chords equivalent up to transposition and inversion is represented by a complex related by its 1-skeleton to a generalized Tonnetz. Complexes are computed with MGS, a spatial computing language, and analyzed and visualized in Hexachord, a computer-aided music analysis environment. 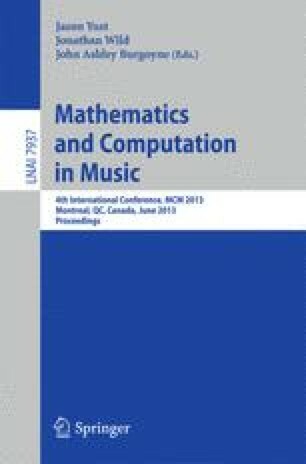 We introduce the notion of compliance, a measure of the ability of a chord-based simplicial complex to represent a musical object compactly. Some examples illustrate the use of this notion to characterize musical pieces and styles.